EpilatorGirl > Tips > Do Epilators Hurt? 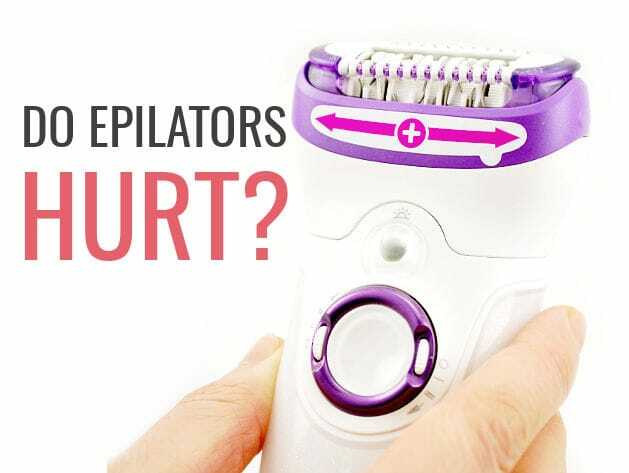 Frankly, the question do epilators hurt is more like a joke to me. There’s no ill intention when I say that. It’s obvious why. They hurt. Yes, epilators cause a lot of pain. Even so, we still end up using them once every 2 weeks on average. We love our smooth skin and we can bear through the pain. Frankly, waxing hurts less. I have experienced both methods and I recommend waxing to people who cannot handle pain that well. Do epilators hurt? Yes, definitely yes. But why do we still end up using them? Because it’s one of the cheapest hair removal methods, while offering a smooth skin for up to 2 weeks. Using an epilator is not complicated. You only buy the device once and use it until it breaks down, which can be for as much as 10 years if you are lucky. Waxing requires a bigger investment, even if you are using an at home waxing kit. You still need to buy the wax, the strips, and the applicators. You also need oil to clean the waxing residues. And not everyone can wax at home. Because the answer to do epilators hurt is yes, a lot of people end up giving up on them rather quickly. That’s why I first recommend waxing, at least as a transition hair removal method for those who want to migrate from shaving to epilators. For men, those who are tired of shaving every 3-5 days, it’s definitely a lot simpler to use an epilator. Those who do try one, get used to it surprisingly easy so I am glad whenever I receive such comments. Do epilators hurt? Yes. But for me there’s a bigger question that also needs to be asked. Do epilators cause ingrown hairs? Yes, for almost everyone at some point. Forget about the pain. Ingrown hairs are horrible. You need to exfoliate from the beginning. Buy a pair of exfoliating gloves or a body scrub and use it almost daily. If things get serious, buy the Pfb Vanish or the Tend Skin Solution. Those chemical exfoliators will make ingrown hairs history. You get used to the pain inflicted by those rotating tweezers that grab the hairs at great speed and pull them from the root. However, the idea is what are you going to do until your skin and senses get used to those new unexpected and somewhat unwelcome sensations? If you want a slightly more gentle epilator, then choose the Panasonic ES-ED90-P. It’s a good device that doesn’t cause as much pain as the Braun Silk Epil 9. I love my Silk Epil 9561 but it’s not a model that I would recommend to someone who is wondering do epilators hurt. Distract yourself. You might laugh at this advice but it helps. Music works but watching something works better. You cannot lose yourself into music the same way you lose yourself into a movie or a TV show. You will also stop measuring how much time has gone by since you started epilating and when it’s going to end. Things get a bit complicated when it comes to cordless epilators because they only work for 40 minutes and then take 1 hour to charge. Unfortunately, they are also the best devices at the moment. The Panasonic ES-ED90-P is one of them. So are the Braun Silk Epil 7 and the SE9. These ones are also the ones with accessories for the whole body plus face. It means that you can use your epilator to remove hairs from the entire body, absolutely any place you want, and you can also use it for facial hair removal. That’s exactly what I’m doing. Also, take an ibuprofen. It doesn’t do much but it might help you relax a bit. For those who are already acquainted to this hair removal method, how would you answer the question do epilators hurt? Short answer: Yes, epilating hurts. Long answer: It’s different for everyone, and on different areas of the body too. First place I ever tried epilating was my ankles … and I couldn’t feel a thing. Epilating my lower leg is essentially painless for me, but I would still flinch waxing it. I’ve always found waxing my underarms less painful than my legs, which as I understand is a bit unusual. While I find epilating my underarms more painful than my legs, it’s very bearable, and the satisfaction of watching as the skin there become bare more than compensates for it. Again, I read lots of reviews from women who won’t ever touch their armpits with an epilator because of the ow factor. My thighs sting more the higher I go, and the bikini line is a Hell No zone which seems pretty standard.